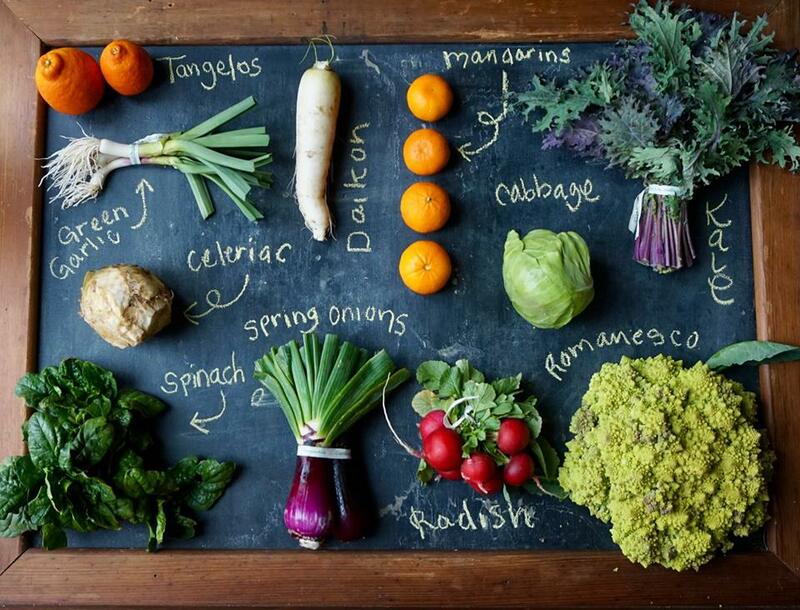 Serving the Bay Area for over 25 years: Click here to join our CSA today! *Carrots- Cut the tops off to keep them fresh longer. Place them in closed container with plenty of moisture, either wrapped in a damp towel or dunk them in cold water every couple of days if they’re stored that long. Celeriac or celery- A delicious form of celery that is pretty new to people's kitchens. Peel, chop and cook with potatoes, mash the lot with more butter and cream than your mother would. Cool and damp is best, so an outdoor, shady vegetable rack is good and the bottom of your fridge even better. Healthy celeriac should keep, unwrapped, for several weeks without any significant loss of quality. Even when cut in half, they will still keep for a week or more, though you may need to shave off a layer to refresh the surface. *Chard- Remove any bands, twist ties, etc. Most greens must be kept in an air‐tight container with a damp cloth to keep them from drying out. Kale, collard greens, and chard do well in a cup of water on the counter or fridge. Keeps 2-3 days. Chives- Wrap in a damp paper towel and store in a plastic bag in the fridge. Keeps about 1 week. *Green Garlic- Green garlic should be stored in the refrigerator, where it will keep for 5-7 days. Wrap the green garlic in a damp paper towel and place it in a plastic bag; or for a non-plastic alternative, stick the green garlic in a tall glass with some water in the bottom. *Raisins- Store in a cool, dry place out of direct sunlight. Refrigeration is recommended in hot environments. Should last several weeks. *Sage or Rosemary- Wrap in a damp paper towel and store in a plastic bag in the fridge. Keeps about 1 week. Can also be hung to dry and will last several months. Spring Onions- You can keep it on your counter for a couple of days or in the crisper in your fridge for up to 2 weeks. *Stir Fry Mix- These baby mixed greens can be stored by lining a storage container with paper towels, place the mixed greens on top, and cover with another layer of paper towels and lock the lid. Make sure there is plenty of space and the greens are not jam-packed in there. Will last up to one week. *Cabbage- Wrap cabbage in plastic wrap and keep it chilled in the refrigerator. An alternative to plastic would be placing it in a tightly-locking container that limits air flow. Properly stored, cabbage should last about a week. *Celeriac or celery- A delicious form of celery that is pretty new to people's kitchens. Peel, chop and cook with potatoes, mash the lot with more butter and cream than your mother would. Cool and damp is best, so an outdoor, shady vegetable rack is good and the bottom of your fridge even better. Healthy celeriac should keep, unwrapped, for several weeks without any significant loss of quality. Even when cut in half, they will still keep for a week or more, though you may need to shave off a layer to refresh the surface. Chard- Remove any bands, twist ties, etc. Most greens must be kept in an air‐tight container with a damp cloth to keep them from drying out. Kale, collard greens, and chard do well in a cup of water on the counter or fridge. Keeps 2-3 days. *Fennel- If used within a couple days, fennel can be left out on the counter, upright in a cup or bowl of water (like celery). If wanting to keep longer than a few days, place in the fridge in a closed container with a little water. Green Garlic- Green garlic should be stored in the refrigerator, where it will keep for 5-7 days. Wrap the green garlic in a damp paper towel and place it in a plastic bag; or for a non-plastic alternative, stick the green garlic in a tall glass with some water in the bottom. *Kale or Mustard Greens- Refrigerate in a plastic bag, do not wash until ready to use. May keep for up to a week. *Radishes- Cover the radishes with another damp paper towel in an airtight container so they stay moist and last longer. Last between 5 days to a week. Raisins- Store in a cool, dry place out of direct sunlight. Refrigeration is recommended in hot environments. Should last several weeks. Cabbage- Wrap cabbage in plastic wrap and keep it chilled in the refrigerator. An alternative to plastic would be placing it in a tightly-locking container that limits air flow. Properly stored, cabbage should last about a week. Celeriac- A delicious form of celery that is pretty new to people's kitchens. Peel, chop and cook with potatoes, mash the lot with more butter and cream than your mother would. Cool and damp is best, so an outdoor, shady vegetable rack is good and the bottom of your fridge even better. Healthy celeriac should keep, unwrapped, for several weeks without any significant loss of quality. Even when cut in half, they will still keep for a week or more, though you may need to shave off a layer to refresh the surface. *Mandarins- These juicy, freshly picked mandarins can be left out on the counter for a few days, but last up to two weeks if refrigerated. * Spring Onions- You can keep it on your counter for a couple of days or in the crisper in your fridge for up to 2 weeks. *Celeriac- A delicious form of celery that is pretty new to people's kitchens. Peel, chop and cook with potatoes, mash the lot with more butter and cream than your mother would. Cool and damp is best, so an outdoor, shady vegetable rack is good and the bottom of your fridge even better. Healthy celeriac should keep, unwrapped, for several weeks without any significant loss of quality. Even when cut in half, they will still keep for a week or more, though you may need to shave off a layer to refresh the surface. Chard or Red Russian Kale- Remove any bands, twist ties, etc. Most greens must be kept in an air‐tight container with a damp cloth to keep them from drying out. Kale, collard greens, and chard do well in a cup of water on the counter or fridge. Keeps 2-3 days. *Chives or Parsley- Wrap in a damp paper towel and store in a plastic bag in the fridge. Keeps about 1 week. Oranges- Keep in a dish on your counter or table. Lasts one week. Or you can store in your fridge for longer storage. *Radicchio or Lettuce- Refrigerate in a sealed plastic bag. Keeps for a week. *Turnips- Remove the greens (store separately) so they don't draw out excess moisture from the roots. Place them in an open container in the fridge with a wet towel placed on top. Lasts up to one week. *Chard or Red Russian Kale- Remove any bands, twist ties, etc. Most greens must be kept in an air‐tight container with a damp cloth to keep them from drying out. Kale, collard greens, and chard do well in a cup of water on the counter or fridge. Keeps 2-3 days. Lemons or Oranges- Keep in a dish on your counter or table. Lasts one week. Or you can store in your fridge for longer storage. * Mandarins- These juicy, freshly picked mandarins can be left out on the counter for a few days, but last up to two weeks if refrigerated. Romanesco- Will last up to one week in a closed container in the fridge, but has better flavor if consumed earlier. Cut florets away from the core and soak in warm soapy water or salt water for 10 minutes to wash away any aphids. Florets can also be lightly boiled in salt water for a couple of minutes for this purpose. Rinse before preparing. *Rosemary- To keep green: wrap in a damp paper towel and store in a plastic bag in the fridge. Lasts one week or more. To dry, leave bound around the stems and hang - last 2 weeks to a month. *Spring Onions- You can keep it on your counter for a couple of days or in the crisper in your fridge for up to 2 weeks. *Turnips or Radishes- Remove the greens (store separately) so they don't draw out excess moisture from the roots. Place them in an open container in the fridge with a wet towel placed on top. Lasts up to one week. *Spinach or Lettuce- Keep damp in an airtight container in the fridge. Keeps for one week. * Cabbage- Wrap cabbage in plastic wrap and keep it chilled in the refrigerator. An alternative to plastic would be placing it in a tightly-locking container that limits air flow. Properly stored, cabbage should last about a week. * Celeriac- Refrigerate unwashed, covered for up to a week. *Daikon- Daikon will last up to 2 weeks stored in the fridge in plastic bag or wrapped in damp towel in fridge. Their greens should be stored separately. You can also cut into smaller pieces and freeze for up to 6 months. *Leeks or Spring Onions- These large alliums are rather mild in flavor and simply melt to perfection when sautéed. Use in soups, stir-fries, or in place of onions in other dishes for a delicious and more subtle flavor. Save the dark green tops for making vegetable stock! Leave in an open container in the crisper wrapped in a damp cloth or in a shallow cup of water on the counter (just so the very bottom of the stem has water). Will last at least a week. *Kale, Red Russian- Remove any bands, twist ties, etc. Most greens must be kept in an air‐tight container with a damp cloth to keep them from drying out. Kale, collard greens, and chard do well in a cup of water on the counter or fridge. Pomelos or Tangelos- Pomelos are the largest citrus fruit. Pomelos can be stored at room temperature for a couple of weeks or refrigerated for up to several weeks. Keep away from direct sunlight and heat. Turnips or Radishes- Remove the greens (store separately) so they don't draw out excess moisture from the roots. Place them in an open container in the fridge with a wet towel placed on top. Lasts up to one week. *Romanesco- Will last up to one week in a closed container in the fridge, but has better flavor if consumed earlier. Cut florets away from the core and soak in warm soapy water or salt water for 10 minutes to wash away any aphids. Florets can also be lightly boiled in salt water for a couple of minutes for this purpose. Rinse before preparing.. Spinach or Lettuce- Keep damp in an airtight container in the fridge. Keeps for one week. *Bok Choy- This crunchy and tasty bok choy is amazing sautéed and adds a little something special to a soup or stir-fry. Store in a plastic bag in fridge up to one week. Don’t forget to use the ribs! Leeks- These large alliums are rather mild in flavor and simply melt to perfection when sautéed. Use in soups, stir-fries, or in place of onions in other dishes for a delicious and more subtle flavor. Save the dark green tops for making vegetable stock! Leave in an open container in the crisper wrapped in a damp cloth or in a shallow cup of water on the counter (just so the very bottom of the stem has water). Will last at least a week. *Mustard Greens- Remove any bands, twist ties, etc. Most greens must be kept in an air‐tight container with a damp cloth to keep them from drying out. Kale, collard greens, and chard do well in a cup of water on the counter or fridge. *Pomelos or Tangelos- Pomelos are the largest citrus fruit. Pomelos can be stored at room temperature for a couple of weeks or refrigerated for up to several weeks. Keep away from direct sunlight and heat. Turnips- Remove the greens (store separately) so they don't draw out excess moisture from the roots. Place them in an open container in the fridge with a wet towel placed on top. Lasts up to one week. *Shallots- Store in a dark, cool, dry, well-ventilated place. Lasts up to one month. If placed in the refrigerator, shallots have a shorter storage life, up to two weeks. I don’t really know what to call this so sticking with Green Sauce for now. Take the stems and chop small, then sauté in a little bit of oil, for about 10 minutes over low temp. Add stock and cook until the stems are really soft. Strain out the stock and save for something else. Throw the cooked stems into a blender with the rest of the ingredients and blend a bit. Add enough water to be able to blend into a smooth sauce. You can use this sauce as a garnish for soup or roasted vegetables, or even as a salad dressing. I made this for Nigel years ago and we loved it. It was such a fun way to use up greens, sneak veg into the diet of a non-vegetable eater and spice up these sausage rolls. Preheat oven to 375 F. In a good sized skillet over medium-high heat, cook chopped bacon until mostly done, then add sausage, breaking it apart. Once the sausage meat is broken apart, add the ground beef. Cook until the beef is crumbly, but before it is completely done add the onions, and garlic. Cook until the onion is somewhat soft then add the chopped mustard greens. Continue cooking until tender. Remove meat mixture from the hot pan and put into a large mixing bowl, allow to cool to the point of being able to handle. Add the eggs, breadcrumbs, cheddar cheese, sage, nutmeg, salt and pepper, mix well. Lay out puff pastry dough on a sheet of lightly floured parchment paper. Put enough of the meat mixture across the length (leaving a good 2 inches of pastry above and plenty below) to make a big fat sausage. Using the parchment paper to help you, roll the pastry over starting from the shorter top end, creating a lovely sausage log. Repeat with the second sheet. Brush both rolls with eggs wash and bake for 30 to 40 minutes until a deep golden brown. Don’t worry if you have leftover meat mix, it tastes delicious fried up and served at breakfast! Preheat oven to 400 F. Put the Romanesco, celeriac, carrots and turnips into a bowl. If you have any cauliflower leftover from last week you can add that to your roasting veg medley. Toss with some olive oil, a good sprinkling of Eatwell Thyme Salt and black pepper. Put onto a parchment lined baking sheet and roast for 15 minutes, toss a little and roast for about another 15 minutes until everything is nice and toasty looking. In the meantime heat some olive oil in a heavy bottomed pot and add the leeks, and garlic. Sauté slowly while the rest of the veg is roasting in the oven. When the roasting veggies are done and them to the sauté pot, along with half the chicken stock. Using an immersion blender puree until relatively smooth. You can leave some chunky bits in for texture. Add the rest of the stock and the pepper flakes, heat and taste for seasoning. Add lemon zest and coconut milk. Taste and adjust seasoning if need be. If you don’t have Eatwell Thyme Salt at home, well you really should get some, but you can use a sprinkling of dried thyme or some chopped fresh thyme and plain salt.